Our BMW M4 rental in LA pushes the boundaries of performance and styling. Out of all the Beverly Hills BMW rentals, this is one of the most fun to drive. The rear-axel subframe with mounts bolted directly to the car makes it one of the best handling sports cars around. The M4 has a light footprint thanks to the Carbon Fiber Reinforced Plastic (CFRP) found on several components such as the trunk lid. Explore Los Angeles by dropping the top on the BMW M4 and immersing yourself with the surrounding environment. 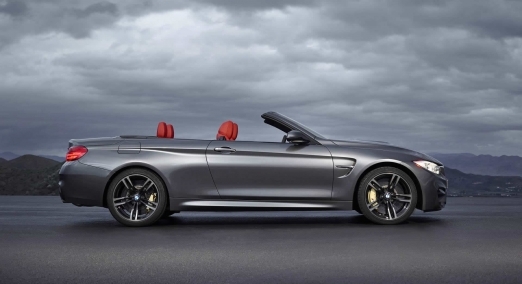 When you rent a convertible BMW m4 in Beverly Hills the hard top roof can be lowered with a push of a button. 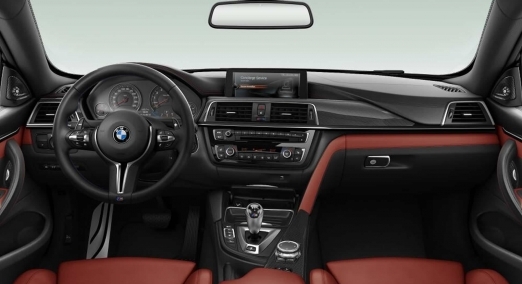 The interior of the BMW M4 looks like it is geared for racing. The beautiful bucket seats hug your body like a glove and come with a 10-way power adjustment to get a precise fit. The lightweight seats even have a backlit M Logo proudly displayed on the seat. The M4 is not as flashy as some of the other exotic car rentals in LA like the i8 but is more of a car enthusiast dream car. Step behind the wheel and you’ll be impressed with the heads up display that allows you to customize the information you see to enhance your driving experience. Along with other small details like M colored stitching on the steering wheel and M badges thought the car make this a one of a kind sports car. Of course, the legendary M4’s most sought out feature is the twin-turbo inline-six engine. The M4 is equipped with a high-pressure, lag-free turbocharge system with two TwinPower turbos and BMW’s double-VANOS technology varies camshaft timing that allows higher pressure buildup inside the cylinder for optimal power output at any rpm. The engine is combined with a 7-speed dual-clutch transmission with paddle shifters for instantaneous seamless shifts. Rent a BMW M4 today in LA and you won’t regret it! We also offer plenty of other BMW sports cars in LA like the 428i, or 228. Give us a call and we’ll do our best to put you behind the wheel of your dream car. The cost to rent a BMW M4 in LA is around $495 per day but can vary based on the time of the year or during special events. We offer BMW M4 rentals for a day and for weekend getaways. We also offer delivery and pickup services for free at LAX Airport or your Beverly Hills hotel upon request. Delivery is also available to other parts of Los Angeles, CA. We will have the M4 washed and ready to go when the car is delivered to you. Let us help you surprise your family or significant other with a BMW Rental for a birthday, prom, wedding, corporate event or as a special gift. We also provide weekly discounts if you’re renting for more than 4 days.